Jane Baxter 1838 [D7072] - $18.00 : Yarn Tree, Your wholesale source for cross stitch supplies. Cross stitch pattern by Victorian Rose Needlearts. 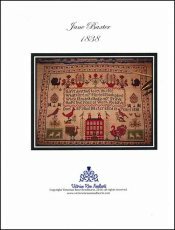 Jane Baxter, aged ten, stitched her colorful red house sampler in 1838. Birds feature prominently, as well as sheep & dogs. Flowering trees & bushes complete the assorted vignettes framing the message, "I have done this to let you see. What care my parents took of me. When I am dead and in my grave. I hope this piece of work you have." Stitch count 281w x 197h.